Welcome to The Perdido Key Beach Rose! I came to visit Perdido Key for the very first time with a friend in 2012 and I fell in love. The area is simply spectacular! Perdido Key itself is breathtakingly beautiful, laid back, and a lot less crowded than other beach towns in the area. The powdery white sand and emerald water are beautiful, especially from the condo's gulf side terrace directly on the beach. I love to watch the dolphins at play in the early morning -- it's hard for me to miss a sunrise -- and the gorgeous sunsets are just as mesmerizing. It was always my dream to own a place on the beach to enjoy with my loved ones, especially my boys. I searched for three years to find the perfect condo and location. The Beach Rose is the perfect spot and the beauty of this coastline, and Perdido Key, is unrivaled.anywhere. I consider myself blessed to own a small part of it. One day I hope to make this my permanent home. Until then, I am thrilled to be able to share it with you and your family so you can create your own wonderful vacation memories. Perdido Key is cose to everything. Nearby, the historic Pensacola downtown offers everything one could want for night life on the coast (fine restaurants, concerts, theater, art galleries, and bars). They even have minor league baseball in a beautiful outdoor stadium on the water, and minor league hockey at the Bay Center. 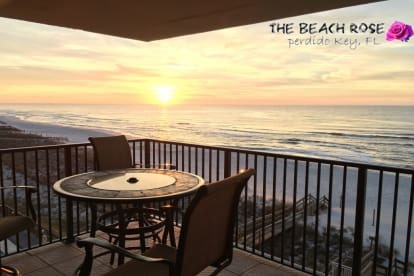 The Beach Rose condo is close to the towns of Orange Beach and Gulf Shores on its western side (approximately 6 miles to the FloraBama), two hours by car from the casinos of Biloxi, and three hours from downtown New Orleans. Go to the Calendar and plug in your desired dates to receive an Instant Quote. You can reserve your vacation in Paradise online directly through the Quote. There are so many things that are unique to the area. Northwest Florida --The Emerald Coast -- is distinctive and very different from the rest of Florida. Come often to visit, and enjoy!